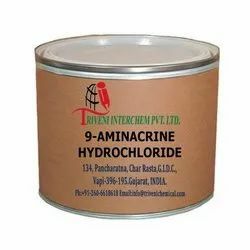 We are a leading Manufacturer of 9-aminacrine hydrochloride from Vapi, India. 9-Aminacrine hydrochloride Monohydrate (52417-22-8) is crystalline yellow. It is also known as 9-Aminacrine hcl. it is use in Vaginal yeast infection Industry. Storage: Keep container tightly closed. Keep container in a cool, well-ventilated area. Waste Disposal: Waste must be disposed of in accordance with federal, state and local environmental control regulations. Looking for Vaginal Yeast Infection API ?